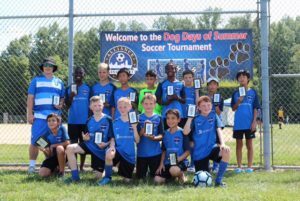 The Commonwealth S.C. 2005 Boys Black were finalists at Dogs Days of Summer in Milford over the weekend of August 19-20, allowing only one goal against them in 4 matches. On Saturday, the team began with a result of a 0-0 tie against Alliance, following by a 6-0 win against CUSE Arsenal. On Sunday they lost a hard fought 1-0 battle against Total Futbol Academy, and ended the day with a 6-0 win over Kings Hammer Vipers to clinch the title of Finalist for the Gold Division. Congratulations to Coach Tappel and all the players!